Over two days — hovering over the burned out grounds of Paradise, California, site of state’s most destructive fire, a legion of drones began recording images of the devastation below. By the time they were done, they had collected 70,000 images over 17,000 acres resulting in 1.4 trillion pixels of data. Joe Rosato Jr. reports. Over two days — hovering over the burned out grounds of Paradise, California, site of state’s most destructive fire, a legion of drones began recording images of the devastation below. By the time they were done, they had collected 70,000 images over 17,000 acres resulting in 1.4 trillion pixels of data. The 518 flights coordinated operation by 16 Northern California emergency responder agencies is believed to be the biggest drone response to a disaster scene in the nation’s history. 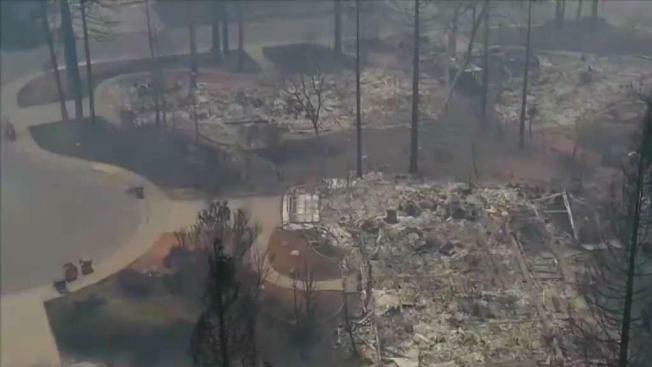 Millin’s company created the software that helped the drone teams map 26 miles of the town of Paradise fire zone into sectors. The company then took the data and turned it into detailed maps which were released just days after the two days of filming was done. “So to be able to create this digital snapshot of the entire 26 miles of area that were affected in just two days is really remarkable,” Millin said. The fire started October 8th killing 88 people so far with another 158 missing — and destroying nearly 20,000 structures. The mapping operation was lead by the Alameda County Sheriff’s Department which boasts one of the most advanced drone teams in the country. Another 15 counties contributed drones and logistics for the mapping project. Kelly said his department’s drone team had done some photographing over the fire zone of Santa Rosa’s Coffey Park which was devastated in the 2017 firestorm. But Kelly said the Paradise operation was the first time so many agencies had coordinated together. Authorities in Butte County publicly released the maps and aerial photography even before many residents had been cleared to enter the fire zone to check the status of their homes. Officials said the detailed footage and maps would help people to determine the condition of their homes — and expedite insurance claims. The footage could also help victims secure FEMA funds. Millin said the drone operation highlights the possibilities of new technology which he said include the potential for fire prevention measures. Millin sat in front of his computer scrolling through the footage — hovering over the ghostly outlines where homes had stood, over swimming pools, chimney stacks and burned out cars. He revealed a map with colored touch points that when clicked on revealed images of the charred properties. “Wow that’s terrible to see this entire neighborhood,” he said zooming into the ashen landscape. Kelly said the other value of the images is they were taken before recent rains, preserving what is essentially a crime scene as the search for victim remains continues. He hoped the images would help residents take stock of their neighborhoods and eventually even aid the rebuilding.